NFC-enabled smartphones have the potential to replace nearly everything else in your pockets, so why not your car keys? 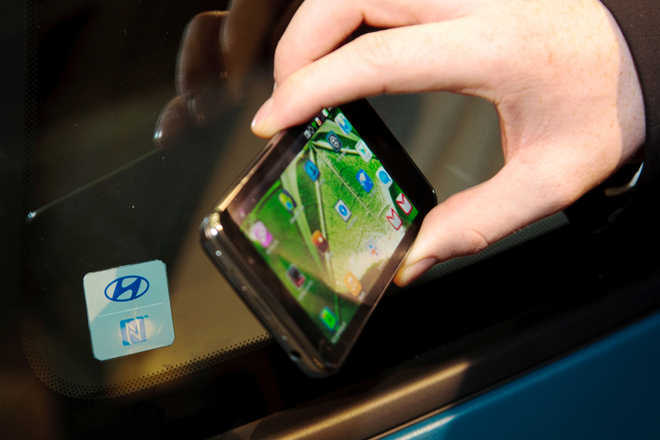 Hyundai is working to do just that, with an embedded NFC tag that allows you to open your car, start the engine and link up to the touchscreen with a simple swipe. Hyundai outfitted its i30 compact hatch (aka the Elantra in the States) with NFC technology in its “Connectivity Concept” recently shown at its European headquarters in Frankfurt, Germany. The idea is simple: Nix the key fob and let your smartphone handle it all. According to the Korean automaker, the driver can swipe their phone across an embedded NFC chip to unlock the car, and once inside, the place the phone in the center console, allowing the car to start, while an inductive charging plate keeps the juice flowing without needing to plug in. “With this technology, Hyundai is able to harness the all-in-one functionality of existing smartphone technology and integrate it into everyday driving in a seamless fashion,” says Allan Rushforth, senior vice president and COO of Hyundai Motor Europe. But unlocking and starting the car is only part of a wider connectivity solution for Hyundai.